"If you only buy one book on wind energy, make it this one. 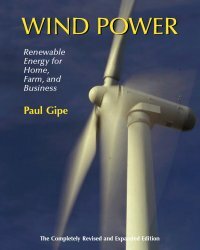 . . Paul Gipe has made a great book even better in his 2004 update of the classic Wind Power for Home & Business. I recommend this book to students, homeowners, and anyone who wants a clear picture of what they're getting into when they are hooked by the wind energy bug. The small wind energy world seems to have a disproportionate share of dreamers, cranks, and charlatans. Paul Gipe cuts through the fog and gives readers straight information on how to capture the energy in the wind. His clear explanation of terms, concepts, and recommended practices will save you many hours and many dollars. "—Ian Woofenden, Senior Editor, Home Power magazine. "This is THE definitive book on wind energy, beautifully, logically organized, with a great wealth of pictures, charts, graphs, formulas, cautionary tales, and a lifetime of knowledge. "—Doug Pratt, Technical Editor, Real Goods Renewables. "At long last, big as well as small wind machines are paying off. Grid-connected wind can compete! Gipe has captured the technology and the excitement of this fast-changing field. His explanations are clear and accessible. His anecdotes provide a human touch. If you're considering your own machine or investing in wind energy, or if you want to understand wind's rebirth, Wind Power is a must. "—Paul P. Craig, Professor of Engineering Emeritus, University of California at Davis; and Chairman, Sierra Club National Energy Committee, 2000-2003. I have several hundred books on wind generators on my bookshelf. I've referred to Gipe's books repeatedly over the years. If I had to choose only two books out of all on the shelves, Paul Gipe's Wind Power: Renewable Energy for Home, Farm, and Business would definitely be a keeper.—Mick Sagrillo, Sagrillo Light & Power, Wisconsin's wind guru. ". . . a really comprehensive, beautifully illustrated reference book. . . This is a tried and tested book you can . . . The new edition comes replete with some useful extra features, a good range of cases studies and a sensible Health Warning about the need to take safety seriously. The only problem will be ensuring that eager colleagues do not make off with your copy! "—Professor David Elliott, Director, Energy and Environment Research Unit, The Open University, Great Britain. "Wind Power is the most comprehensive, down-to-earth guide available. Paul Gipe, an acknowledged world expert, has produced an indispensable book for anyone considering purchase of a wind turbine. Whether discussing huge 2MW turbines or small home units, Gipe tells you what you want to know in straight-forward, jargon-free language, and with plenty of illustrations. Contrary to much trade literature, Gipe does not ignore the pitfalls of putting up a turbine. . . Wind Power is a highly recommended book for anyone interested in the rapidly-expanding world of wind energy. "—Robert W. Righter, Author of Wind Energy In America: A History. "Wind Power is comprehensive and authoritative. Anyone interested in sustainable energy resources will find it informative. Those interested in wind machines for their home, farm or business will find it essential. "—Rich Ferguson, PhD, Research Director, Center for Energy Efficiency and Renewable Technologies. "Gipe´s Wind Power is a must read for everyone who is involved--or wants to be involved--in wind energy. The reader will get a comprehensive overview of the most important new energy technology available to save the world's climate: Windenergy. "—Sven Teske, Renewable Energy Director, Greenpeace. "Wind Power is an absolute visual treat and worth getting just for the pictures and diagrams. Wind energy is both simple and highly complex. The simplicity is such that any child can design a rotating machine that will turn in the wind. There are two layers of complexity, the first the range of disciplines wind energy crosses, these include Physics, Statistics , Electrical and mechanical engineering, financial management, economics, environmental and utility legislation and of course Politics. Paul does an excellent job at supplying solid primers on all these areas. The other layer of complexity is the fog of dis-information that is in the sector, Wind energy is filled with wacky inventors, snake oil salesmen and born again Environmentalists. It is easy to be distracted and misled, this is an excellent book in shining a light on this rather obscure side of wind energy. If you have a friend who is looking at investing in a wind turbine or in wind energy do them a favour and get them this book. "— Michael Layden, sustainable energy consultant, Arigna, Ireland. "Everything you need to know about small wind energy in one book. Paul Gipe's encyclopaedic knowledge of the wind industry is again evident in this latest edition. The beautiful colour photos and graphics bring the subject to life and give a real feel for the technology. This is a unique text book, but the style is easy and informative. "— Hugh Piggott, Scoraig Wind Electric, Scotland. "Paul Gipes books and fascinating photos enlighten and bring realism to the opportunities of renewable energy for the benefit of the environment, the new economy, and the peaceful supply of energy resources. "—Preben Maegaard, Folkecenter for Renewable Energy.